This is the definitive guide of what to do and where to go for parents, carers and children in Bristol. 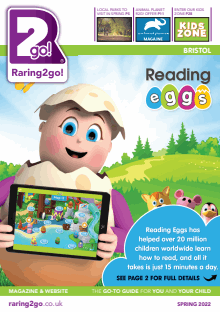 The Raring2go Bristol! magazine is produced quarterly and jam packed full of events, activities and offers all to help you! In the magazine and on the website there are lots of great prizes and savings to be had - make sure you join as a member to enjoy all of the benefits! Looking for that martial art school, local ballet teacher, family-friendly cafe or restaurant? I will publish a list of great clubs and classes for all age ranges, and much more for kids to do! If you are organising activities or events for children aged 0-12 then please enter the details - for free and they will be posted here. Take a look at my Facebook page for the latest news and ideas for local families. MoJo Active, an outdoor activity centre for Children and adults near Bristol. Companies and parties.